Wishing you were in Italy instead of in Salem, NH? Let Bertucci’s transport you to the Italian countryside with an authentic Italian meal. Our scratch-made dough, tomatoes that are specially sourced, and roasted vegetables combine for fresh Mediterranean-inspired creations every day. Choose from our famous brick oven pizza, delectable pasta, indulgent dessert options, or any of other Italian masterpieces. For residents of Woburn, nowhere beats Bertucci’s for Italian food. Our team is dedicated to cooking with real Italian recipes and using fresh, delicious ingredients in every dish. Although we first became known for our incredible brick oven pizzas, we also have a number of other meal choices available, including calzones made with whatever ingredients you choose and gluten-free choices for those with certain sensitivities. No matter what you opt to order, you and your part are sure to be pleased. Our team works hard to create a cozy atmosphere, bringing all of our patrons a wonderful dine-in experience that simply can’t be replicated anywhere else. As a matter of fact, we take great pride in being one of Salem’s best venues for celebrations of all kinds. 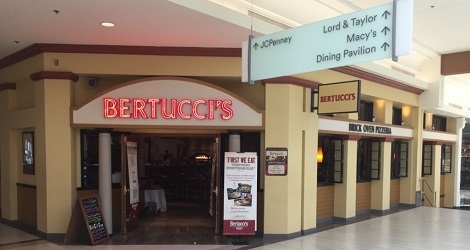 No matter what milestone event you and your loved ones have coming up, Bertucci’s is the establishment to host it! If you are interested in reserving tables ahead of time or you have particular requests, don’t hesitate to give our staff a call today. We love helping families make their best memories and we’re excited to assist you in planning the perfect meal.